Shopian remains the very first ancient town of Kashmir, rooted as it is in the very first dawn of history of Kashmir. It is a historical town situated in theSouth of Kashmir at the foot hills of 'Peer-Panchal' mountain range. The mountain pass at 'Peer-Ki-Gali', 11,000 feet above the sea level, has facilitated a link, rather the very first link, between Kashmir and the sub-continent India. In middle ages this route became known as the famous "Mughal-Road" because of the journeying of Mughal Carvans from Agra to Srinagar. District Shopian is famously known as Apple Town in the sub-continent. This town, now a District Headquarter has got a brilliant history at its back. In the Judicial history of Kashmir, the court at Shopian appears to have been created before the independence of India. Initially this court has functioned as Munsiff Court from 1921 to 1958 and in 1958 this court was promoted as Sub Judge Court. The court was placed in a rented building on the banks of 'Nalla-Singaloo', a stream passing on the southern side of the town. The court was then shifted to the present building in fifties. 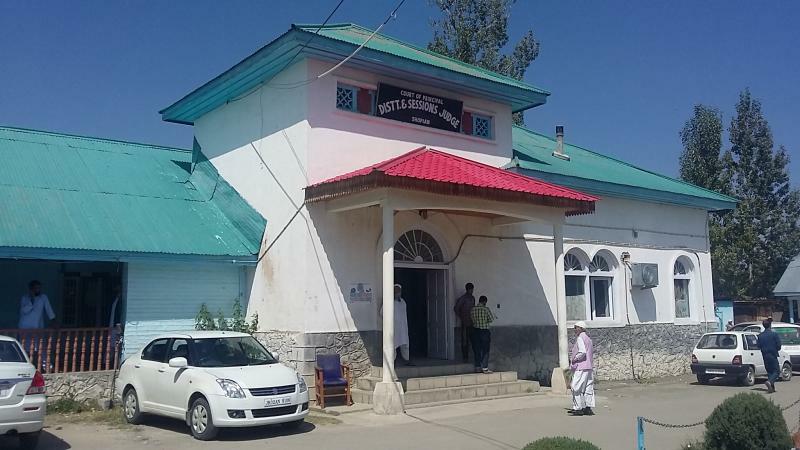 In 1979 the Judicial Magistrate Court was upgraded as Chief Judicial Magistrate, having jurisdiction right from Qazigund to Pampore, now three districts of District Kulgam, District Shopian and District Pulwama. Earlier to this, the court was exercising jurisdiction. The veteran personalities who have remained members of this Bar Association or have remained associated with this association during their practice in this court are Justice Janki Nath Bhat, Justice Moti Lal Bhat, Justice Mohammad Mansoor Mir, Justice Mohammad Yaqoob Mir & Justice Bansi Lal Bhat. The District & Sessions Court came in to existence in the year 2008. The first Principal District & Sessions was Mr. Asmat Hussain Shah from 28-06-2008 to 31-12-2008, 2. Mr. Syed Tawqeer Ahmad from 31-12-2008 to 03-09-2011, 3. Mr. Rashid Ali Dar from 10-09-2011 to 21-05-2012, 4. Mr. Shujat Ali Khan from 28-05-2012 to 23-09-2014, 5. Mr. Mohammad Ali Khan from 24-9-2014 till 24-07-2017. 6. Mr. Ashok Kumar from 26-07-2017 till date.